Beijing? Check. Shanghai? Check. The Great Wall and Forbidden City? Can’t miss. They are all worth the trip, beacons of China’s 5,000-year-old civilization, but here is something you or your travel agent may not have thought of as part of China tourism: beach time. 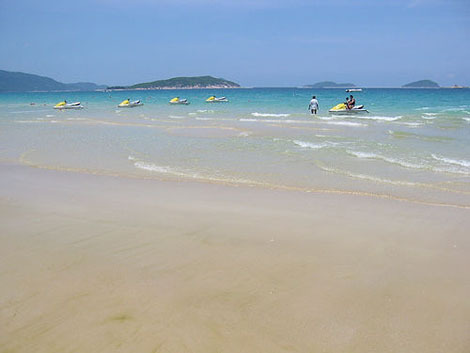 At Sanya, on Yalong Bay at the southern end of Hainan Island, sun and surf are the main attractions. One of China’s 28 provinces, Hainan lies only 30 miles off the mainland’s southern rim. Not so Jeff Denny, of Cincinnati, and his wife, Melissa, who with their children, Caleb, 13, and Holly, 10, had traveled from Shanghai to spend some time on the Sanya beaches during the recent May Day holiday. It was their second visit here since being posted to China by Procter & Gamble. 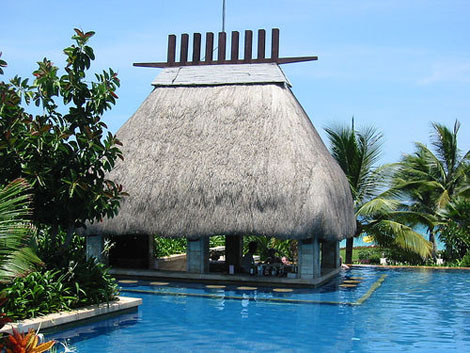 But despite her proselytizing among ex-pat friends in Shanghai, Melissa Denny noted, Hainan does not enjoy the recognition as a tropical Asian destination that Phuket in Thailand does, or Bali in Indonesia. "When Americans come to China, they go to the Great Wall, the Summer Palace, the Forbidden City, maybe Xi’An and the terra cotta warriors," complained Zhang Qi, director-general of the Hainan Provincial Tourism Administration. "But here in Hainan, we also have seaside resorts. Americans just don’t know about Hainan and the beaches." For tourists already in China, however, Hainan is a quick hop. Direct flights from Beijing, Shanghai, Hong Kong and other Chinese cities are frequent. A ferry links Zhanjiang on the mainland to Haikou. And train service (provided via rail-equipped ferries) from mainland cities all the way to Sanya was inaugurated for the May Day holidays. Haikou, the provincial capital at the northern tip, started the island’s tourism industry and boasts a number of resort hotels within a 20-minute drive of the downtown. But Sanya, a three-hour drive south, has become the premier tourist destination in recent years, with a dozen major resorts overlooking Yalong Bay’s gently sloping beach on one side and a deeply green golf course on the other. It is cheapest to fly to Hong Kong, then to Sanya, on Hainan’s southern end, for about $237 round-trip on Dragonair. Flights from Hong Kong to Haikou, the capital city on the northern end of the island, start at $424 round-trip on China Southern. Train and ferry service also link Hainan to the mainland. The two-hour train to Zhanjiang is about $20; the overnight train to Guangzhou about $50.